1) Jon Krosnick, a Stanford political psychologist and survey methodologist, summarizes recent surveys on attitudes toward climate change, efficiency, and efficiency costs in this New York Times Op-Ed column (The Climate Majority). One pattern of findings: "Large majorities opposed taxes on electricity (78 percent) and gasoline (72 percent) to reduce consumption. But 84 percent favored the federal government offering tax breaks to encourage utilities to make more electricity from water, wind and solar power." Electric utilities often find that when they offer customers the option of buying "green" energy at a premium, few people are willing to pay the premium. Using a tax break to subsidize lower prices on green energy could encourage greater participation. 2) A survey from the Consumer Federation of America finds that Americans greatly overestimate the oil reserves under US control. The mean response was 40%. The CFA reports that the true number is 3%. "The federal government has recently required automobile manufacturers to increase the fuel economy of their motor vehicle fleets from an average of 25 miles per gallon to 35 miles per gallon by 2016. Do you think the government should increase this standard to an average of 50 miles per gallon by 2025?" Understanding the true level of US reserves increased support for a 50 MPG standard from 65% to 73%. Here's the full survey summary. "Fuel economy is a measure of how far a vehicle will travel with a gallon of fuel, whereas fuel consumption is the amount of fuel consumed in driving a given distance. Although each is simply the inverse of the other, fuel consumption is the fundamental metric by which to judge absolute improvements in fuel efficiency, because what is important is gallons of fuel saved in the vehicle fleet. The amount of fuel saved directly relates not only to dollars saved on fuel purchases but also to quantities of carbon dioxide emissions avoided. Fuel economy data cause consumers to undervalue small increases (1-4 mpg) in fuel economy for vehicles in the 15-30 mpg range, where large decreases in fuel consumption can be realized with small increases in fuel economy. The percent decrease in fuel consumption is approximately equal to the percent increase in fuel economy for values less than 10 percent (for example, a 9.1 percent decrease in fuel consumption equals a 10 percent increase in fuel economy), but the differences increase progressively: for example, a 33.3 percent decrease in fuel consumption equals a 50 percent increase in fuel economy. Recommendation: Because differences in the fuel consumption of vehicles relate directly to fuel savings, the labeling on new cars and light-duty trucks should include information on the gallons of fuel consumed per 100 miles traveled in addition to the already-supplied data on fuel economy so that consumers can become familiar with fuel consumption as a fundamental metric for calculating fuel savings." The report relies on fuel consumption as its main metric when evaluating improvements--this is critical because it evaluates improvements to vehicles that range from trucks on the low end (that get 3 MPG) to hybrid technologies that achieve 100 MPG. 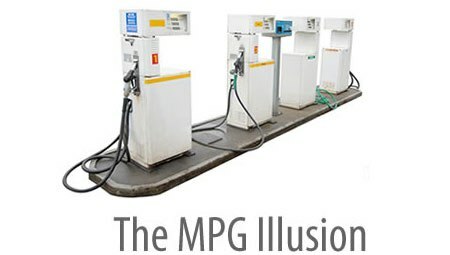 Calculating the fuel savings from new technologies is easy with fuel consumption but confusing, at best, with MPG. For example, improving a truck's MPG from 3 to 4 saves 8 times as much gas over the same distance of driving as improving a hybrid car's MPG from 50 to 100. Finding 2-2. The relationship between the percent improvement in fuel economy (FE) and the percent reduction in fuel consumption (FC) is nonlinear, e.g., a 10 percent increase in FE (miles per gallon) corresponds to a 9.1 percent decrease in FC, whereas a 100 percent increase in FE corresponds to a 50 percent decrease in FC. This leads to widespread consumer confusion as to the fuel-savings potential of the various technologies, especially at low absolute values of FE. A pdf or hard copy of the report costs some money, but you can read it online for free. Here's the free NAS summary. 4) The Obama administration has issued a memo directing "the government to set the first-ever mileage and pollution limits for big trucks". Section 1 of the "Presidential Memorandum Regarding Fuel Efficiency Standards" requests that the EPA and the National Highway Traffic Safety Administration immediately begin work on a joint rule-making under the Clean Air Act and the Energy Independence and Security Act of 2007 to establish fuel efficiency and greenhouse gas emissions standards for commercial medium- and heavy-duty vehicles beginning with model year 2014, with the aim of issuing a final rule by July 30, 2011. This marks the first time that large commercial trucks will have to meet national fuel economy targets. In Section 1, the president specifically requests that the EPA and DOT consider the recommendations of the NAS report, as well as to take into account the market structure of the trucking industry and the unique demands of heavy-duty vehicle applications; job creation within the industry; and applicable state standards.